Important Announcement: This event has been moved to the entrance of Mabuni Hill. Please take note of this if you plan to attend. 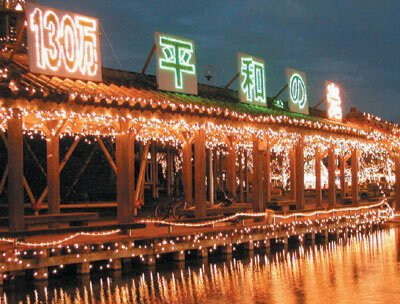 Millions of twinkling lights are the heart of holiday cheer for tens of thousands of spectators across Okinawa this Christmas season. From the Southeast Botanical Gardens near Kadena Air Base in central Okinawa to Gyokusendo and Itoman in the south, the shimmering seasonal displays are attracting flocks of visitors expressing astonishment at the brilliance and complexity of the well thought out lights patterns. At Gyokusendo, the accent is on the limestone cave at the country’s third largest cave complex. Fantasia Illumination runs daily 9am to 6pm through March 31st, as hundreds of strands of blue lights create the holiday magic. Itoman’s Illumination, now in its seventh year, attracts more than 10,000 visitors a day. The Itoman Peaceful Illumination bergins December 23rd and runs to January 3rd. More than 1.3 million light bulbs are spread through the trees and draped across buildings at the Itoman Nishiazki Shunsui Park on the city’s Westside. The basic displays reflect across the park’s pools and ponds, echoing the designs ranging from animals to birds to simple artistry. The lights are illuminated daily 6pm to 10pm, although city fathers have been known to fudge a bit and flip the lights on a little early. This year’s displays go a notch further, paying homage to the Battle of Okinawa’s 60th anniversary. The three-month battle April through June 1945 led to the end of World War II. Sixty thousand lights illuminate a prayer display for world peace at Itoman Kanko Noen. The Itoman Peaceful Illumination will feature concerts this holiday season, as well as a New Year’s Eve spectacular that includes a countdown and fireworks. Cost is \200. Information is available from the Heiwa-no Hikari Committee at 098-840-8137. Cameras are a ‘must’ this year, not only for the lights, but for the talented local groups offering a variety of musical and dance performances covering not only Eisa and Taiko drummers, but folk songs and a bit of pop too. Organizers promise something special for each evening. Take Highway 58 to Naha, then continue south to Itoman City. The highway turns to Highway 331 after passing the Naha Military Port. Approaching Itoman, follow signs to Nishizaki Athletic Park. The signs are in English. A landmark for the right turn to the park is an Esso gas station at the third traffic light in the city. This is a very popular event, attracting thousands upon thousands each evening. Plenty of parking is available, but expect to walk a bit to the park. Dress warmly because the breeze coming off the water can often prove chilly.